I am still learning to see… or, at the very least, I am beginning to discern what has always been there – right before my eyes. Just as once I came to the realization that light finds its greatest meaning in darkness, I am learning that the present is heightened and defined by the awareness and acknowledgment of the past. If you can imagine the present as an image, imagine it as light and bright. It is only through the dark shadows of the past that the present can find real depth and vibrancy; it takes on the richness of meaning and understanding. The Kaneaki Heiau (Mākaha Valley) with its eerie silence seems to be only a pile of stones in a curious formation – unless you see it as the remnants of the pre-Christian Hawaiian religion of Kamehameha I. It surges to life only if you realize that this is where Kamehameha the Great is believed to have lived while gathering his forces to unite the islands in the Battle of Nu‘uanu Pali (1795). You can feel the very ground beneath your feet begin to vibrate and heave with the groaning of history itself and, in the shafts of sunlight filtering through the clouds, you can begin to “see” long ago Hawai‘i. The Royal Order of Kamehameha I was founded in 1865 by King Kamehameha V (Lot Kapuāiwa) in memory of his grandfather, King Kamehameha I. It marked the 70th anniversary of the Kingdom of Hawai‘i and became the kingdom’s first Knightly Order. 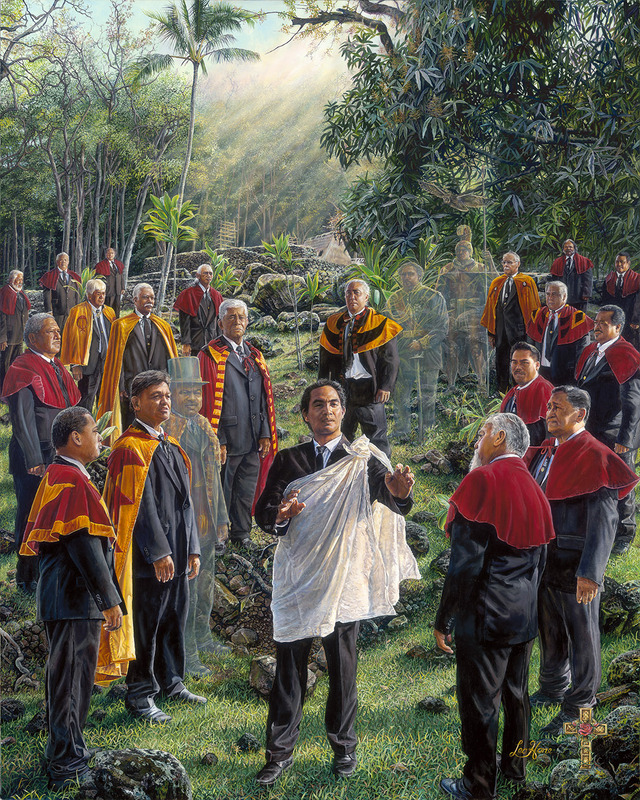 The initial purpose of the Order was to create a fraternity of noble, highly moral men, who would make it their mission to protect the Crown and the people and to preserve and perpetuate the culture and traditions of Hawai‘i. During the reign of King Kalākaua, the Royal Order fell into disuse, finally becoming obsolete in 1893 with the diabolical overthrow of the monarchy. In 1902, it was reorganized by Prince Jonah Kūhiō Kalaniana‘ole, (the man who most likely would have become King had the monarchy survived). During this period, the society went underground, still existing for the preservation and protection of all things Hawaiian, but now in a time of despair when the Hawaiian culture itself was under siege, the birthright of the Hawaiian people in serious peril. If you consider the present day Royal Order of Kamehameha I separate from its history, you look only on a bright, one-dimensional portrait with no definition or depth. Today, the members of the Royal Order are the sons (grandsons, great-grandsons) of the proud and fervent Hawaiian men who rose up to safeguard Hawai‘i nei from within. New faces emerge for a time, only to fade and become replaced… but the society itself stands. If you cannot see the shadowed faces from the past, how can you really see and understand the faces from the present? Who are they – if you sever their connection to their forerunners? Their identity is intrinsically linked to their history just as the identity of those who follow will be linked the ones who so proudly stand for Hawai‘i nei today. I really believe that to stand anywhere unaware of those who stood there first is to stand there alone, isolated. So, you see, I am still learning to see…. and I see them standing shoulder to shoulder with their ancestors, quiet strength and pride of race flowing unrestrained by time. It has now become impossible for me to see the present without the influence of the past. SETTING: The Kaneaki Heiau, an agricultural heiau in Leeward O‘ahu, with some of the Ali‘i and Mamo Hawai‘i members of Royal Order of Kamehameha I, Moku o Kapuāiwa (Ch. 8), also Leeward O‘ahu. On the left: Ali‘i Nui Ali‘i Sir William F. Roback Jr., KGCK (Maui) behind Kalaimoku Ali‘i Sir Eddie Akana, KGCK (Ch. 8). Despite the fact that I myself am a Christian and despite the fact that Hawai‘i became constitutionally a Christian monarchy under Kamehameha III, I have chosen to use this heiau in the backround as presentative of the Kapu system in the time of Kamehameha I. It is history – pure and simple. This heiau signifies growth. (I find it significant that today the area around this heiau is being returned to the Hawaiian people.